Wow! Where did July go? It just whooshed right by me while I’ve been stuck in remodeling hell! It’s finally time to unveil the official 2017Knit Dizzney yarn colorway, and we hope you’ll be please! As I no longer have my usual dye set-up available due to said remodel, I’m having to do things differently, so this colorway is a little different that what you’re used to coming from Dizzy Blonde Studios, but I’m rather liking it and I’m hoping you do too! “Tangled Dreams” will soon be available for purchase or pre-order! It’s 100 grams, 400 yards of luscious high-twist MCN sock, in dreamy Blush Pink, soft Lilac Purple & refreshing Shamrock Green. All this luxury for only $27. 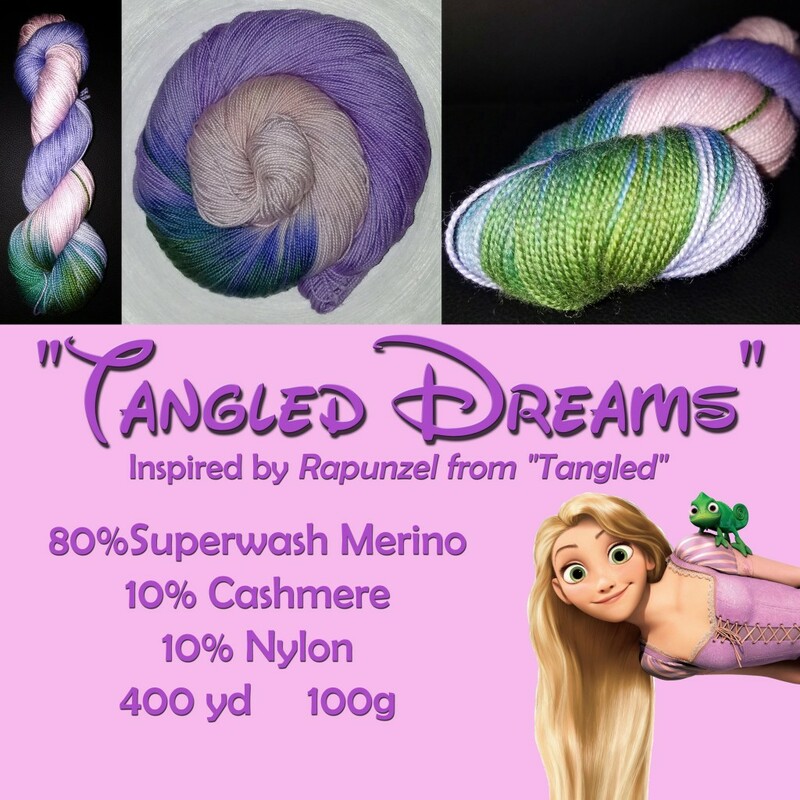 “Tangled Dreams” will be dyed on an “as ordered” basis, so please allow 2-3 weeks for delivery. “Tangled Dreams” is available to everyone, but for a limited time only. If you’re unable to attend Knit Dizzney, and want to purchase just the yarn, you will be able to do so *here, starting July 26th until September 30th, 2017. Otherwise, you can pre-order by using the form that I will post shortly. Pre-ordering is only for those who will be attending Knit Dizzney 2017 or for those ordering additional exclusive Knit Dizzney 2017 swag. Deadline for pre-orders is August 21, 2017. I would like to order 2 skeins. The order form doesn’t show yet. I know after August 15th just didn’t read all the way. Sorry. You are in luck! I haven’t put the t-shirt order in yet, however I will be doing so this afternoon. The order form for the t-shirt can be found at the bottom of this post. The order form for both yarn colorways and project bags can be found at the bottom of this post. Will you be joining us for Knit Dizzney 2017 as well?